When the UT Department of Theatre & Film production of Sophocles Greek tragedy, “King Oedipus,” opens next month, the cast will be wearing costumes designed by fellow student, Lynnette Bates. Lynnette is a senior pursuing a dual major in Theatre and Japanese language. She has served as an assistant designer on a previous production, “Labyrinth” (Fall 2010), but this is her first production as the lead designer. “This is the first time my designs are being taken off the page and made into reality,” she says. 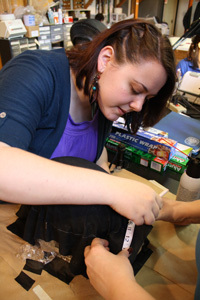 Mentoring the process of transforming her designs into fabric is Daniel Thobias, the department’s costume design faculty, and Kaye Pope, the department’s costume shop manager.